Like the subtle cast their name suggests, Silhouette window shadings, with the Signature S-Vane, easily create beautiful gradations of light and shadow. 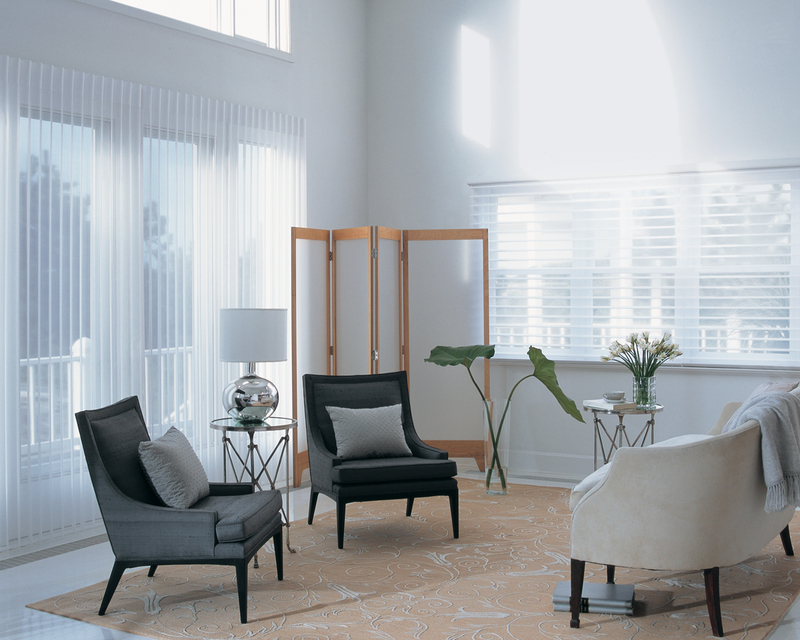 Soft fabric vanes are suspended between two sheers, diffusing softened light deep into a room. 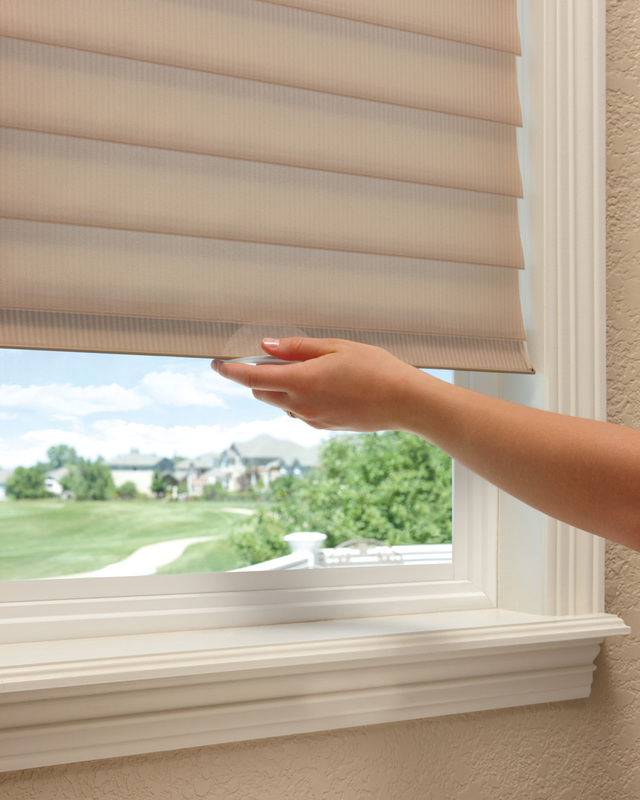 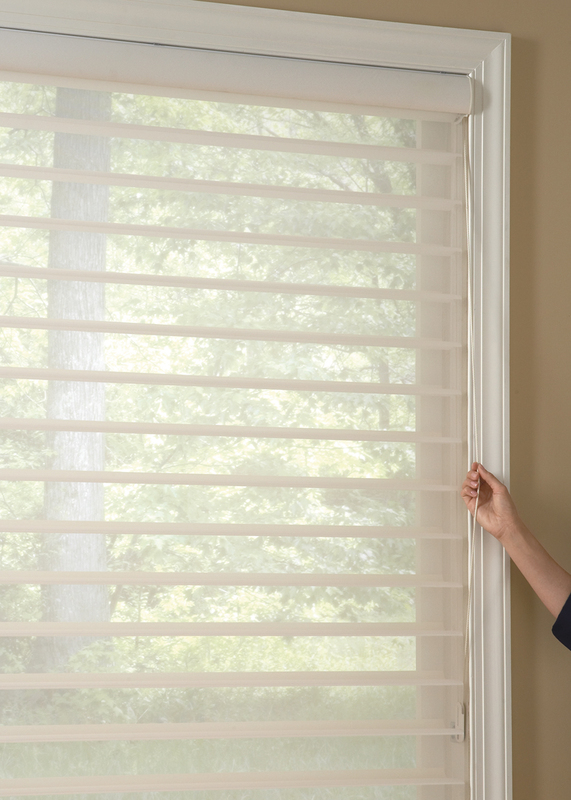 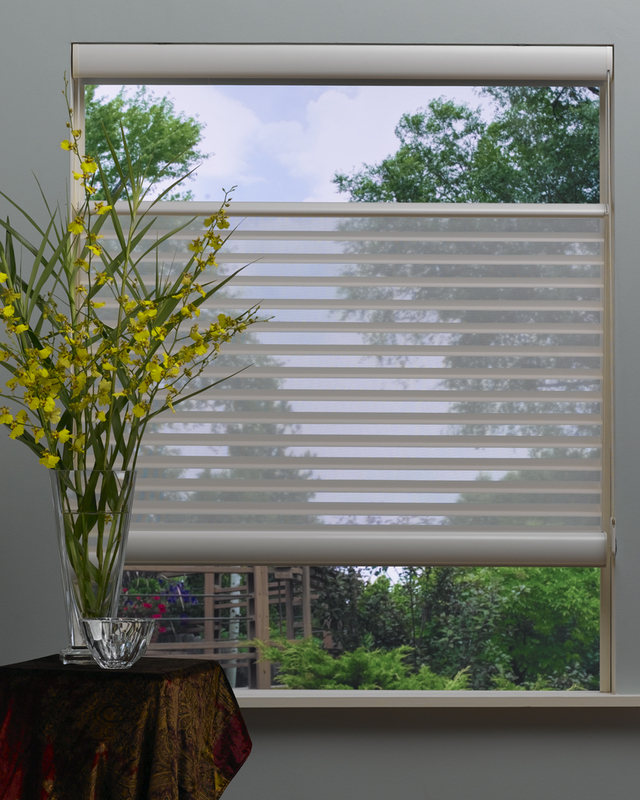 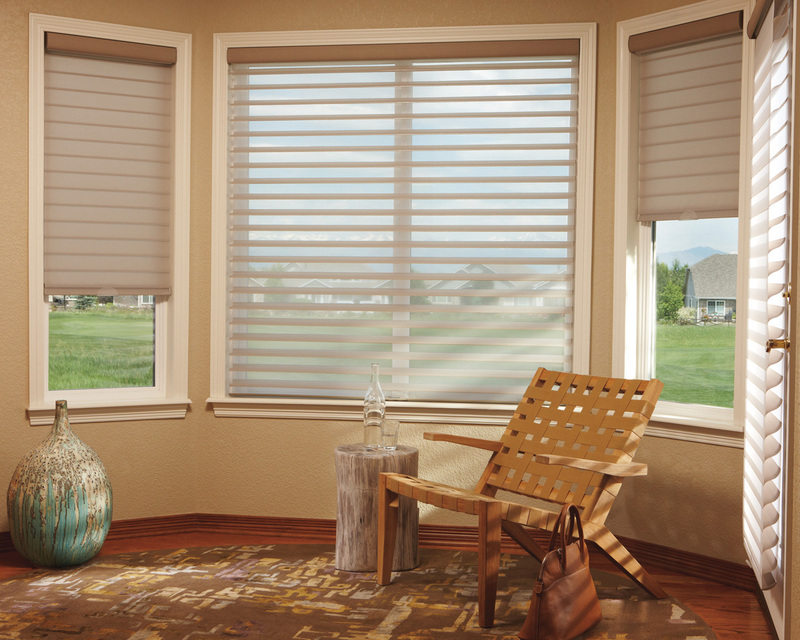 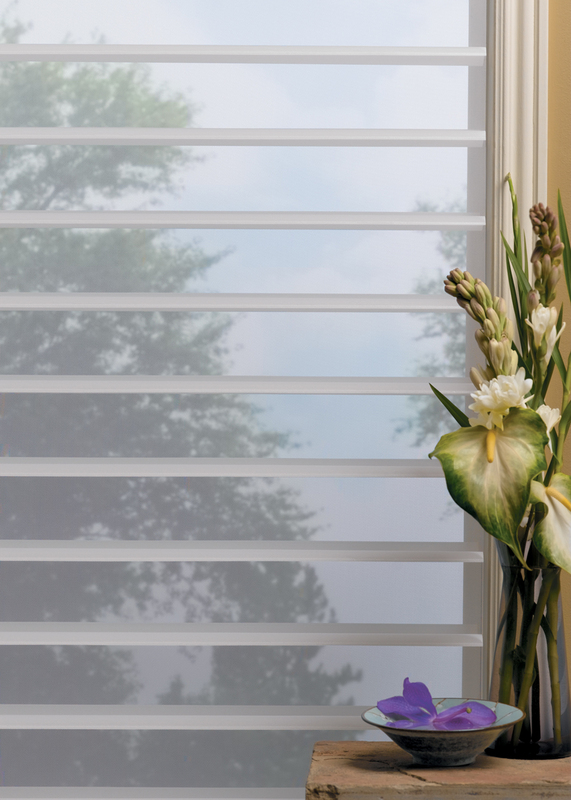 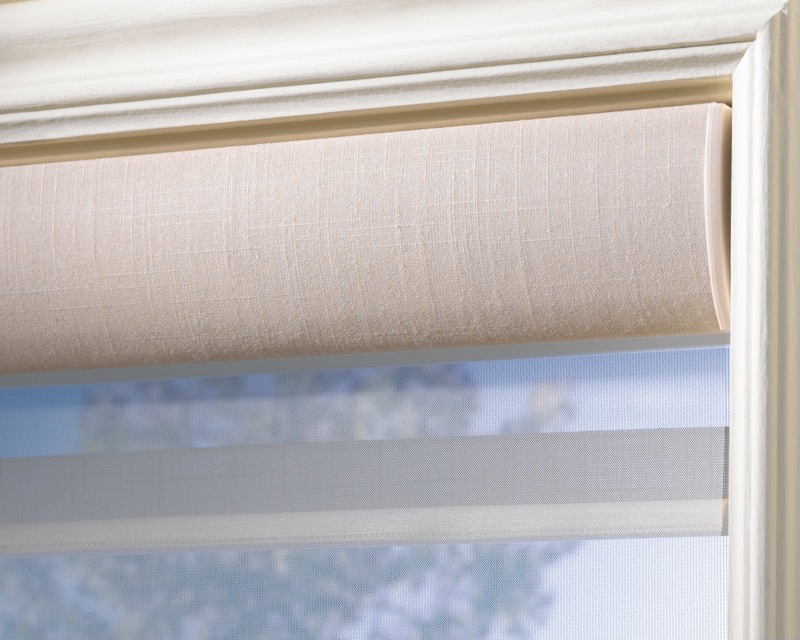 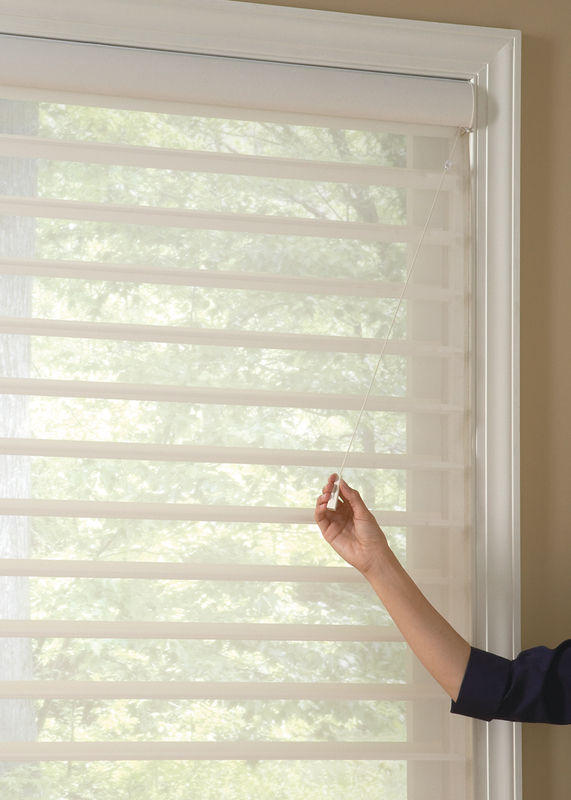 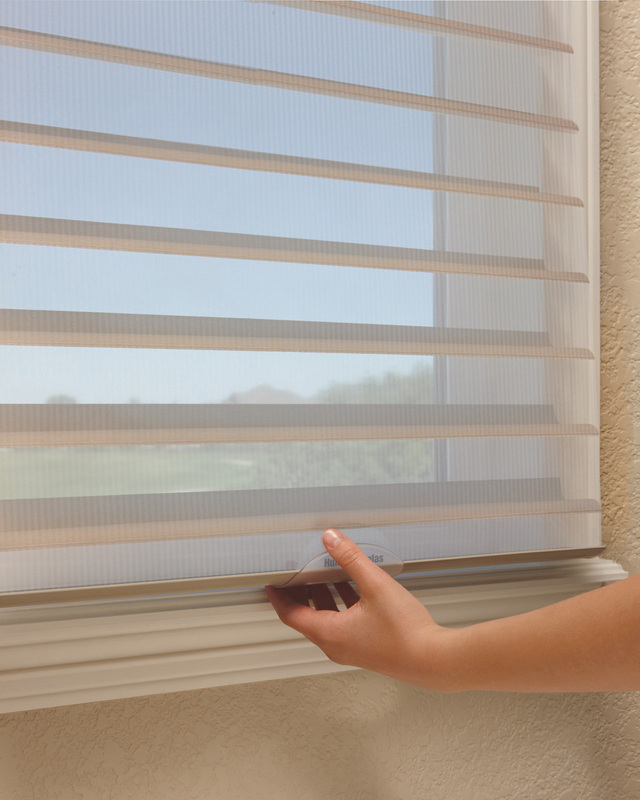 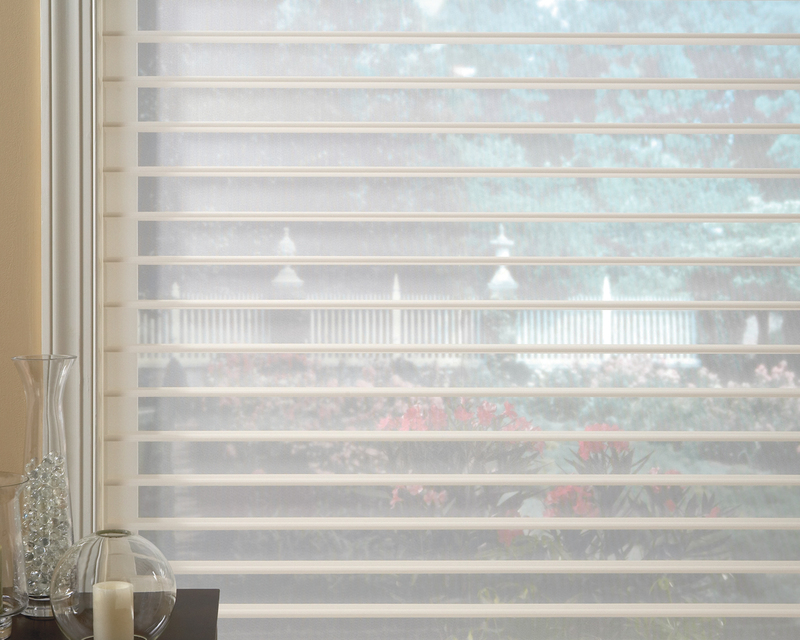 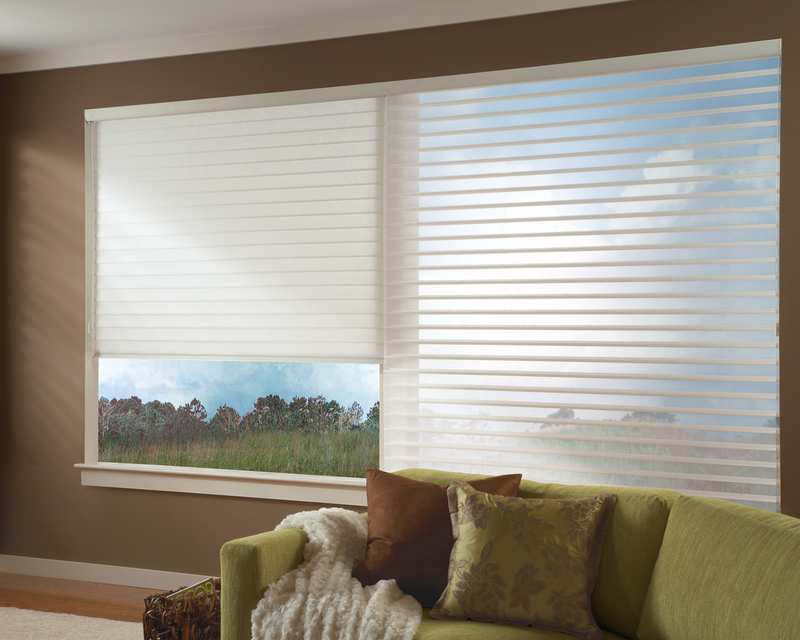 Tilt the vanes to suit the privacy you desire while maintaining UV protection. 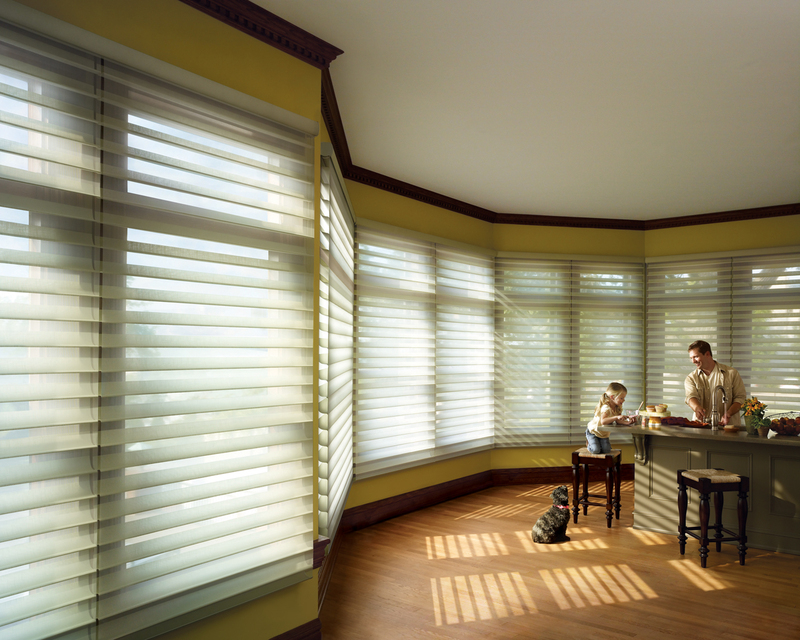 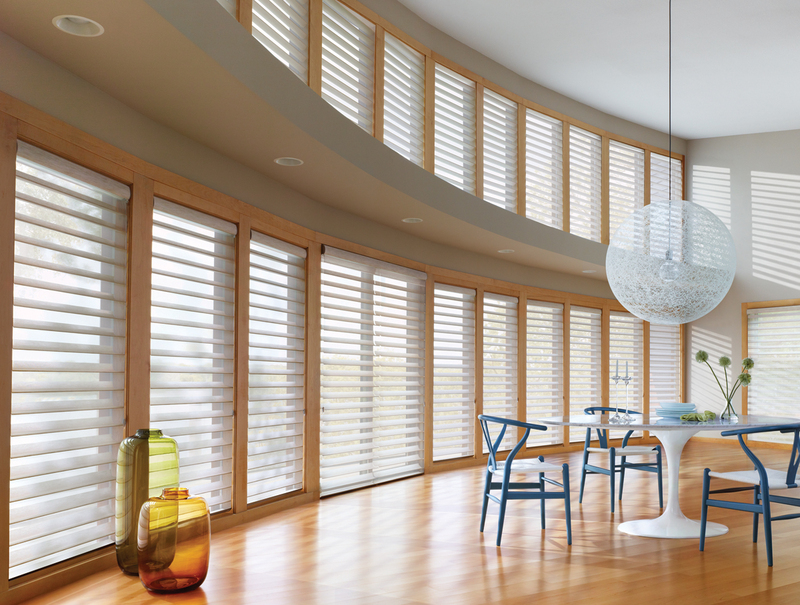 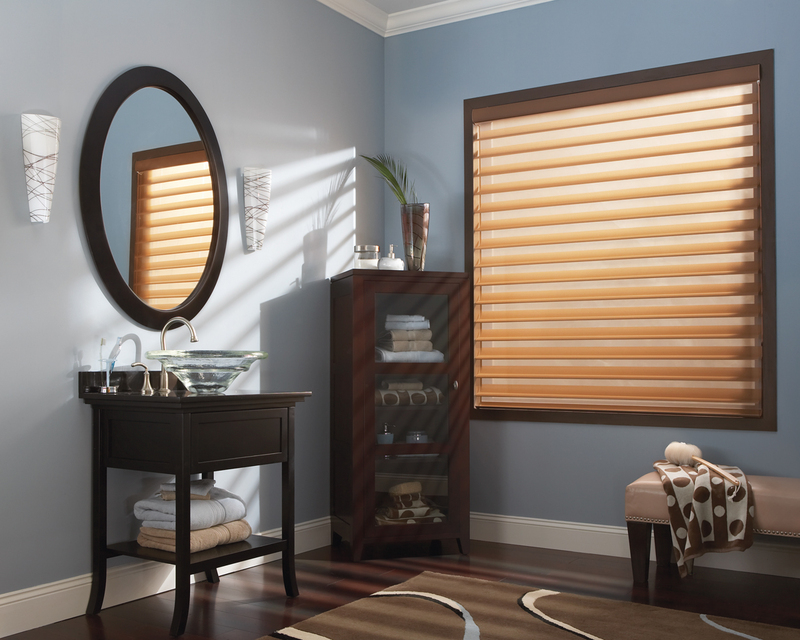 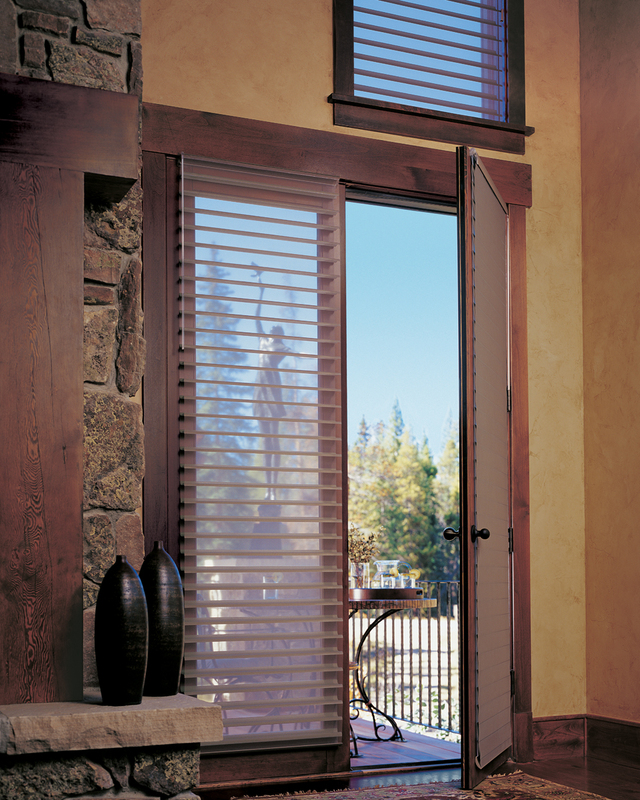 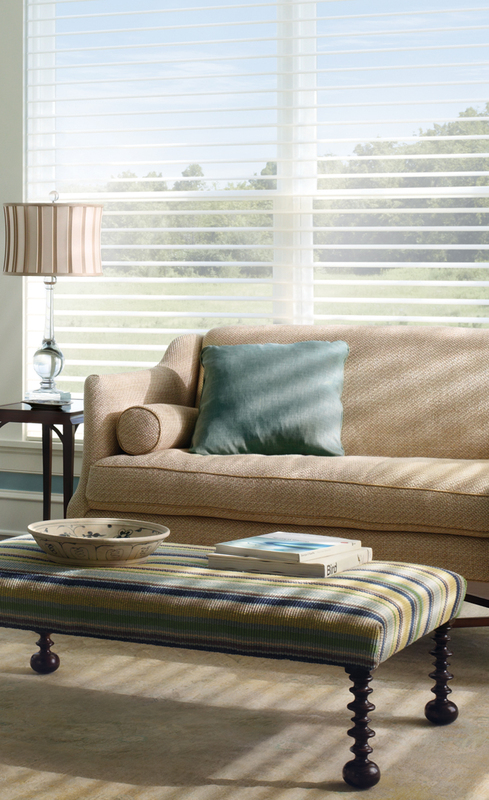 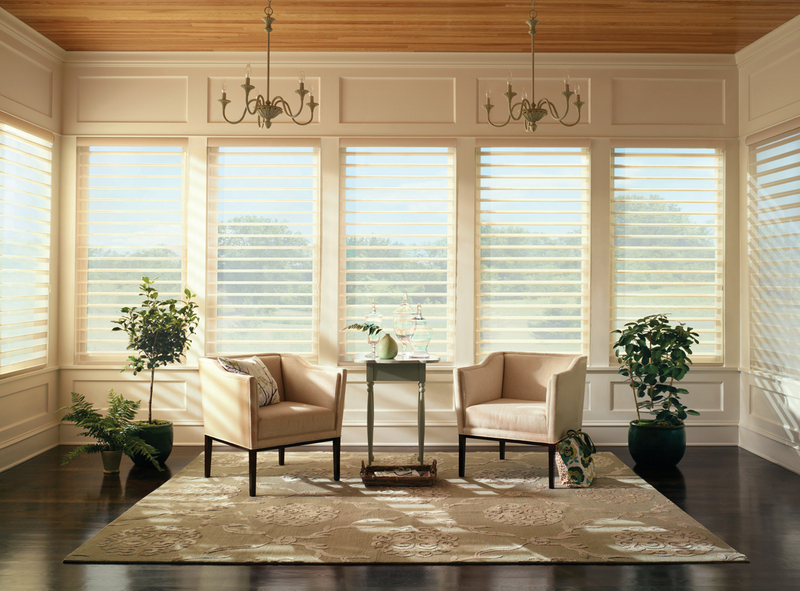 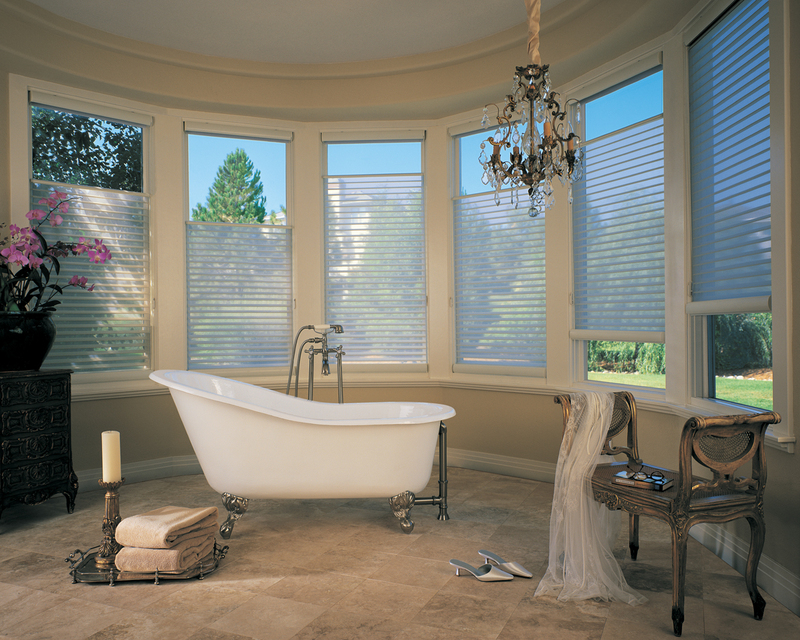 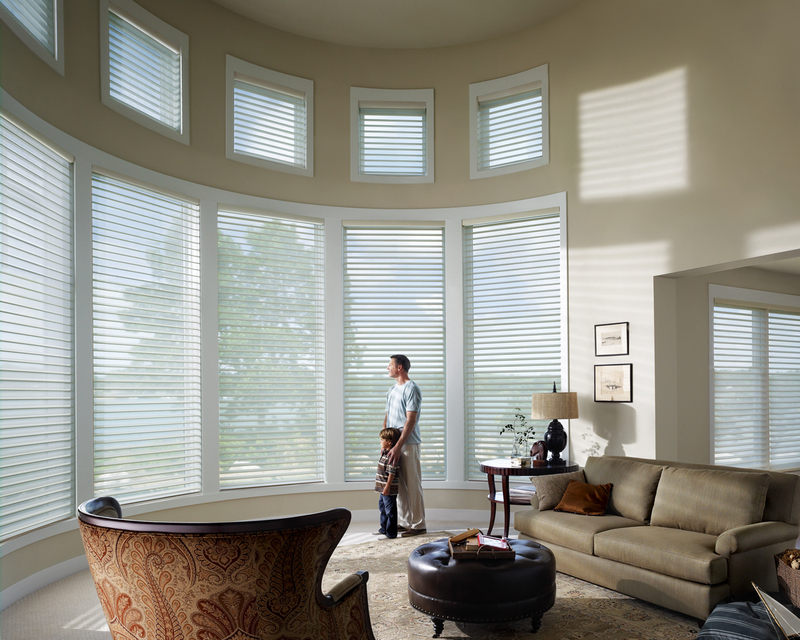 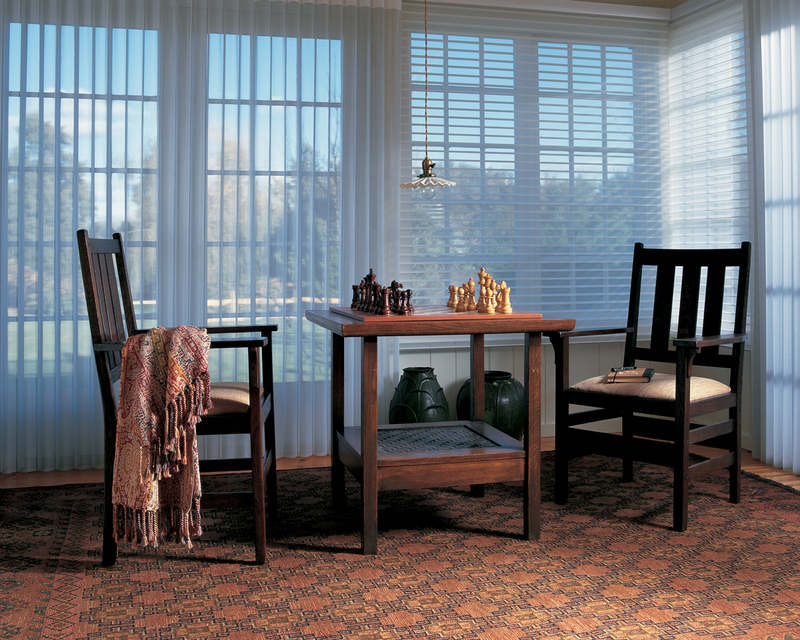 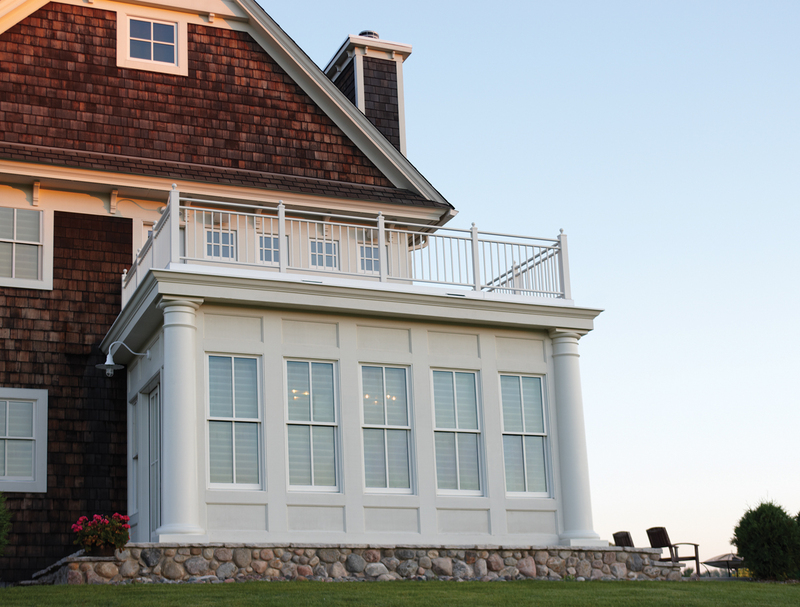 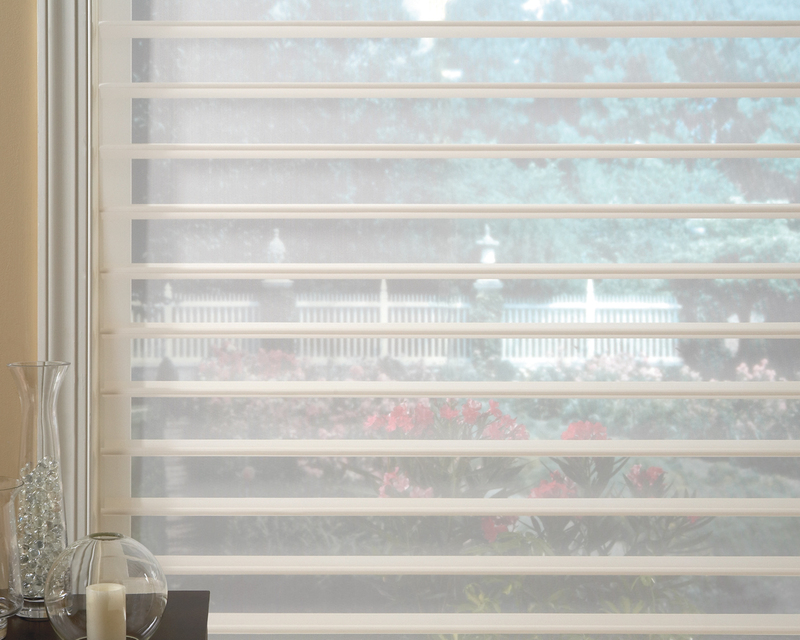 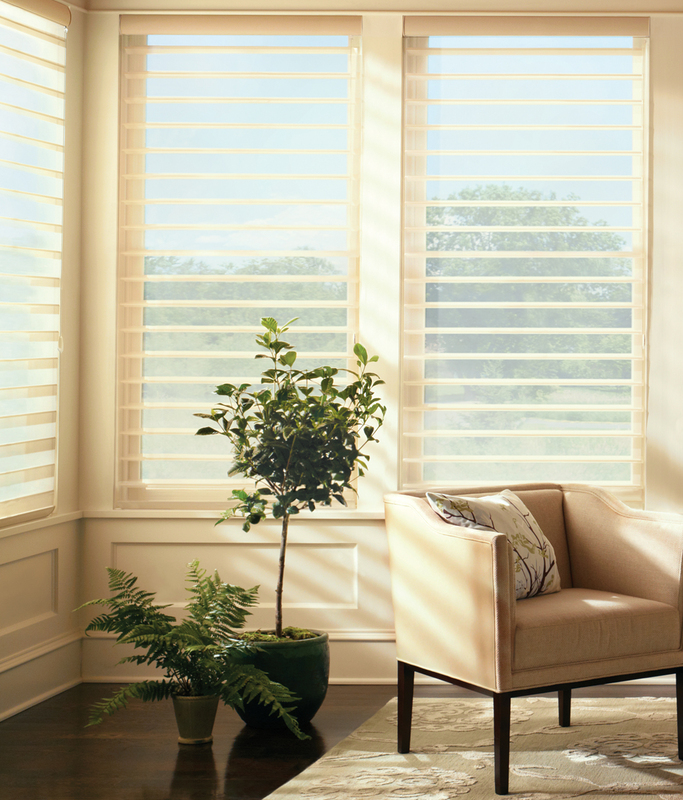 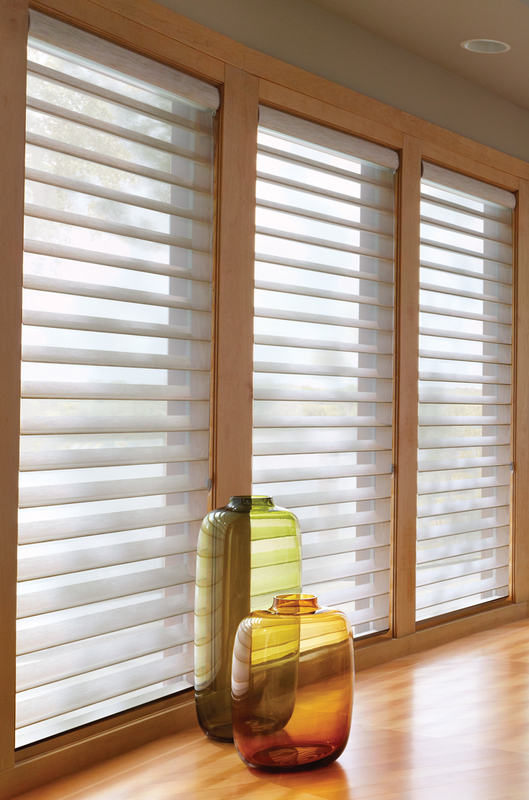 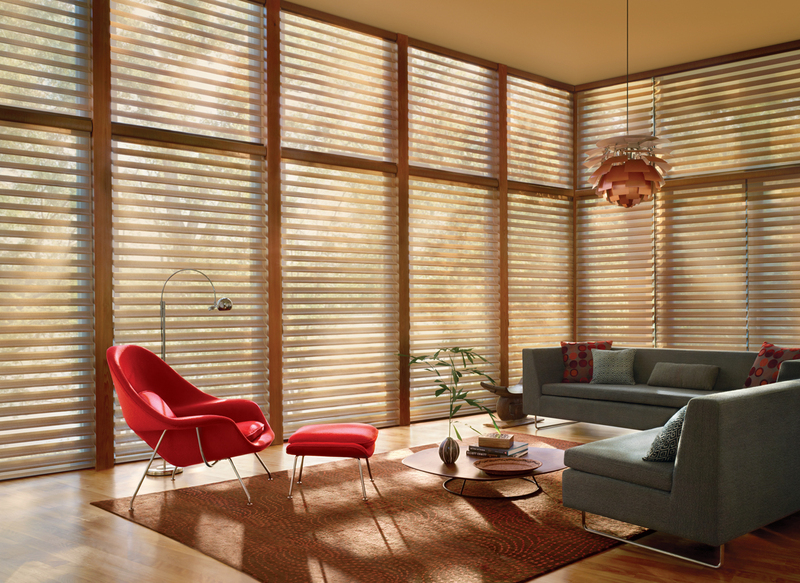 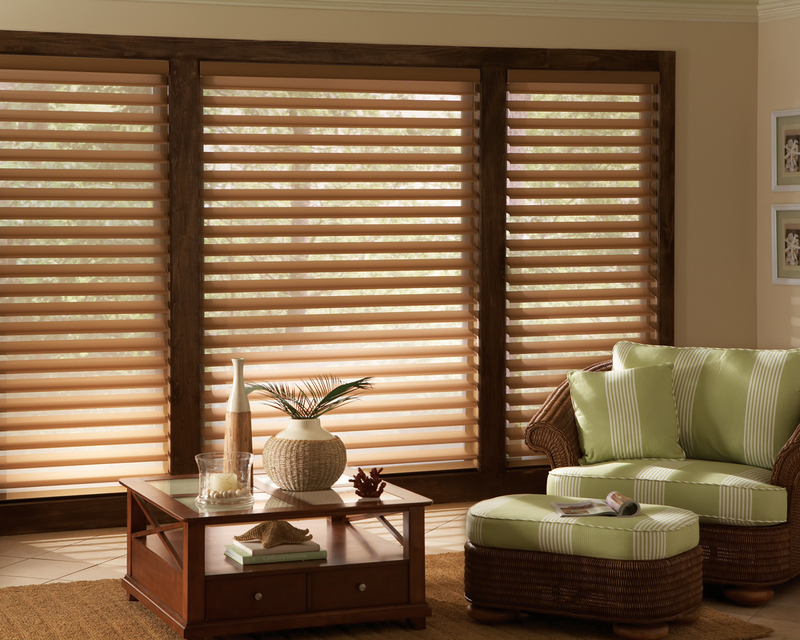 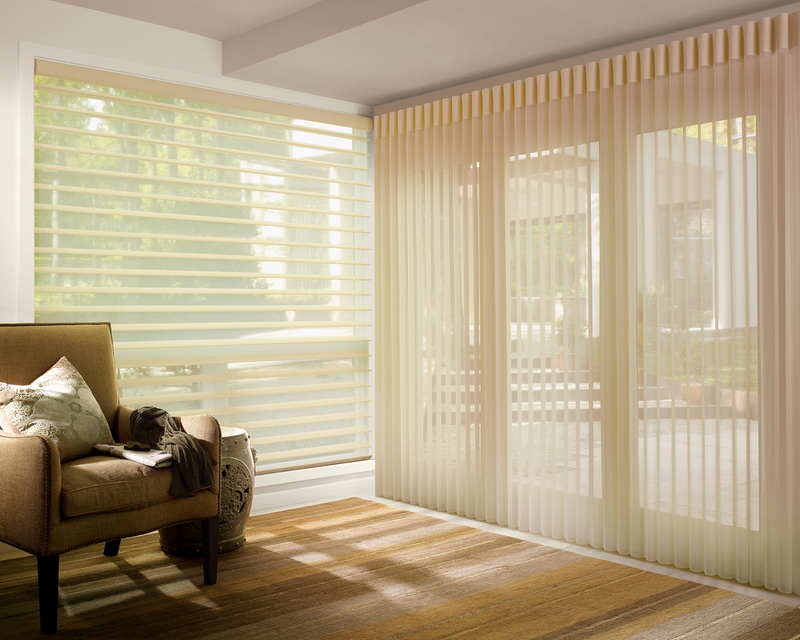 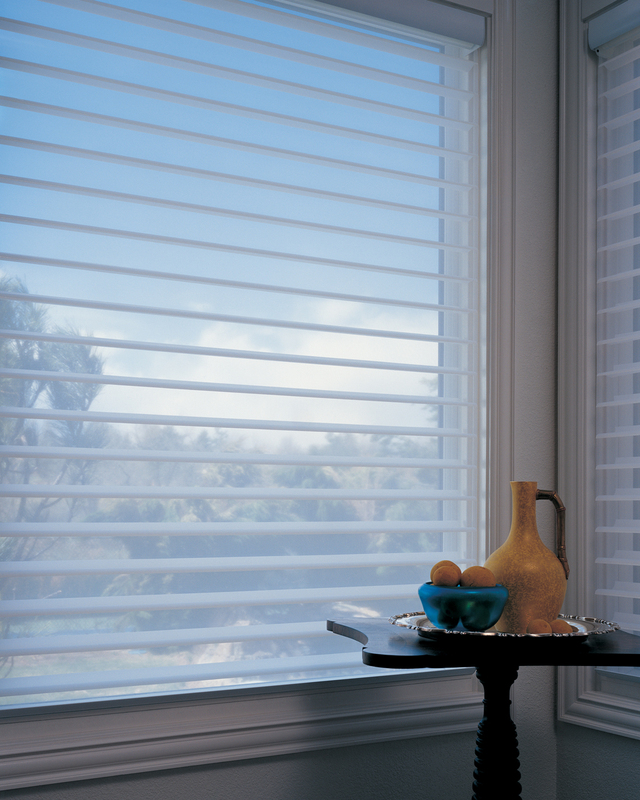 Silhouette® window shadings, with the Signature S-Vane™, were introduced in 1991. 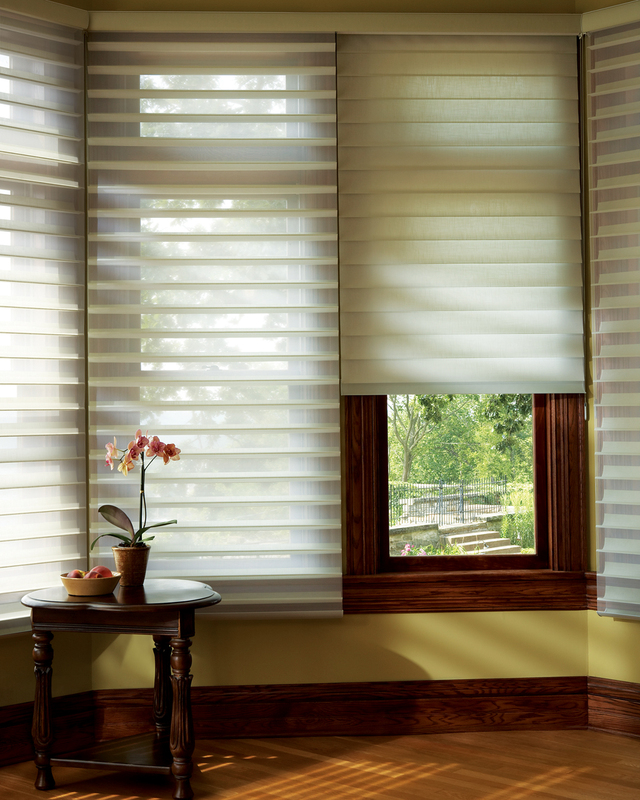 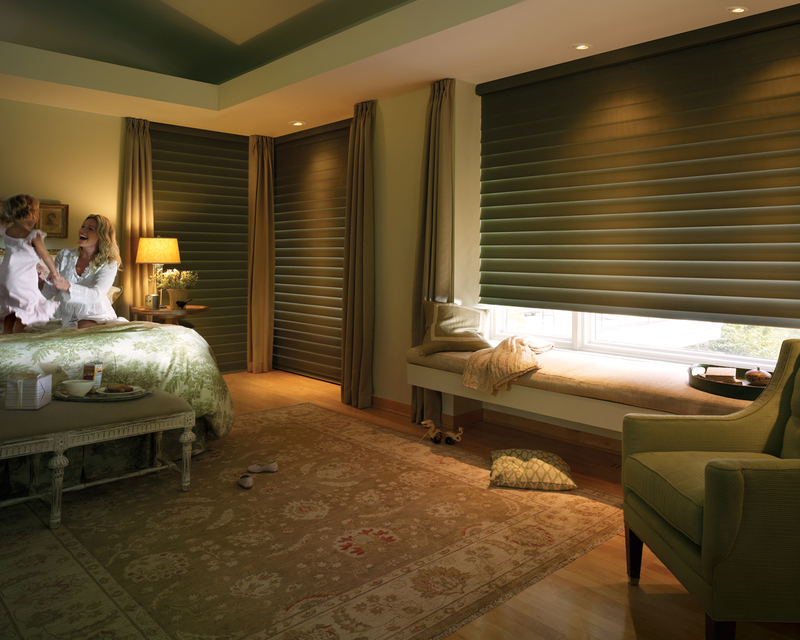 With superior ultraviolet protection, Silhouette shadings offer many beautiful fabrics and applications. 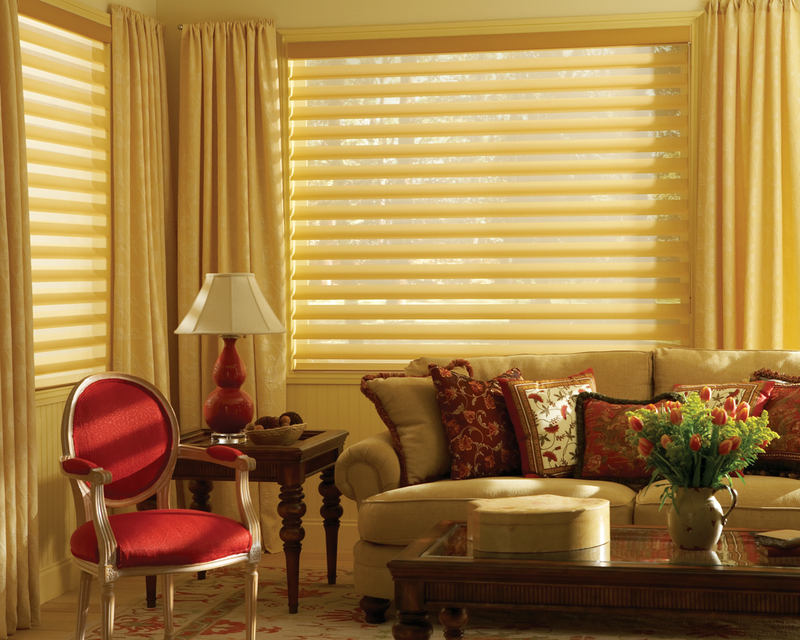 16 popular colors with classic-woven vanes. 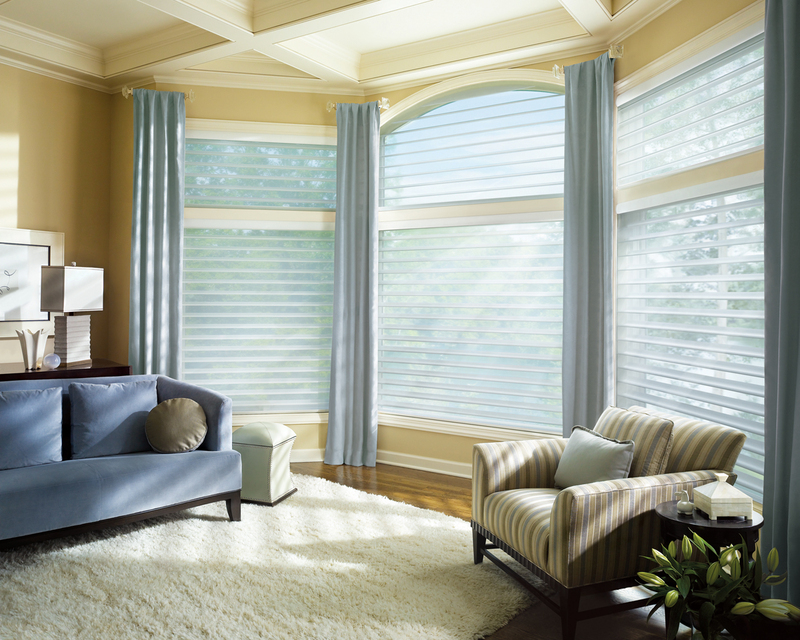 8 designer colors with light-dimming fabric vanes. 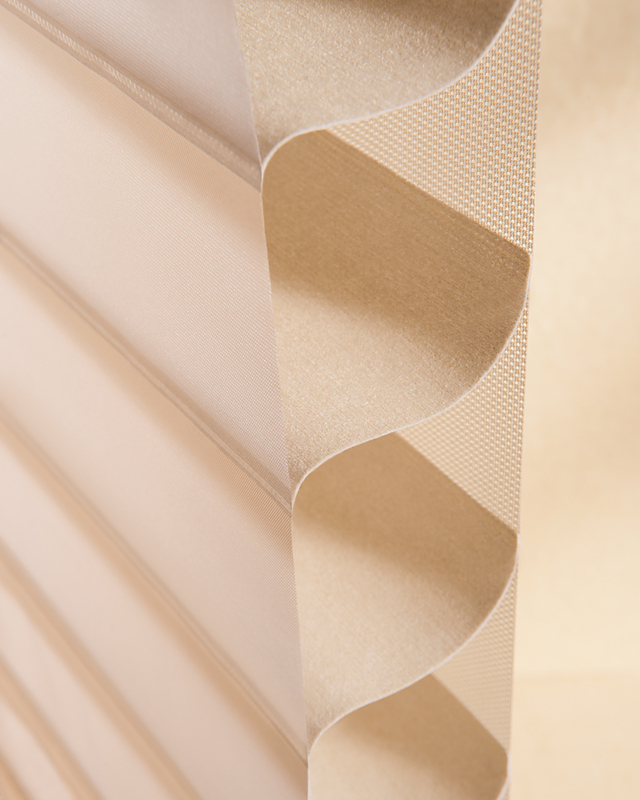 8 soft, neutral colors with linen-textured vanes. 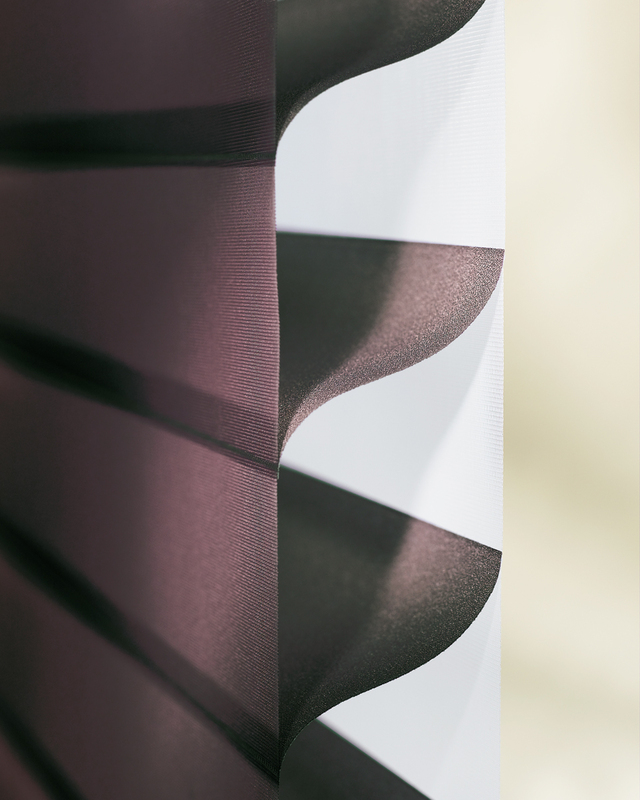 8 colors with finely-patterened vanes. 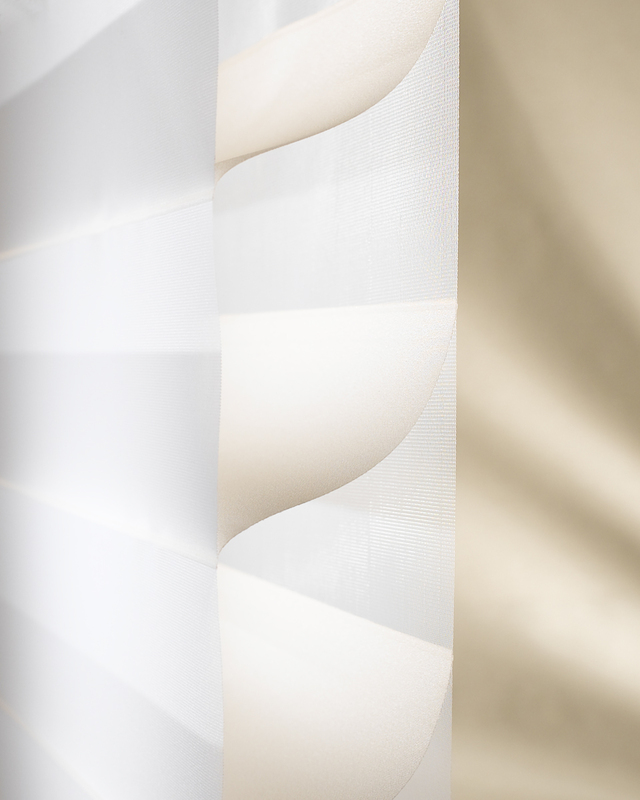 8 subtle colors with raw silk-textured vanes. 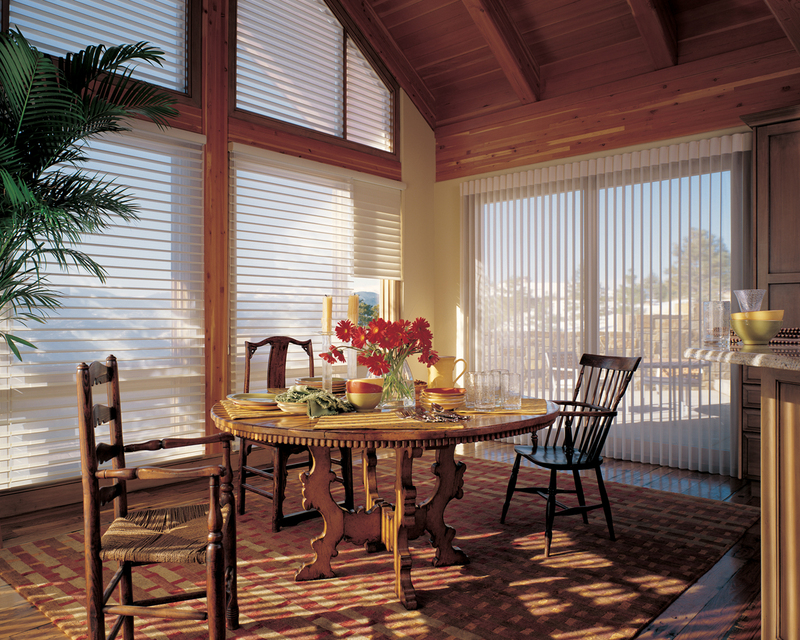 12 bold-colored sheers with light-dimming fabric vanes. 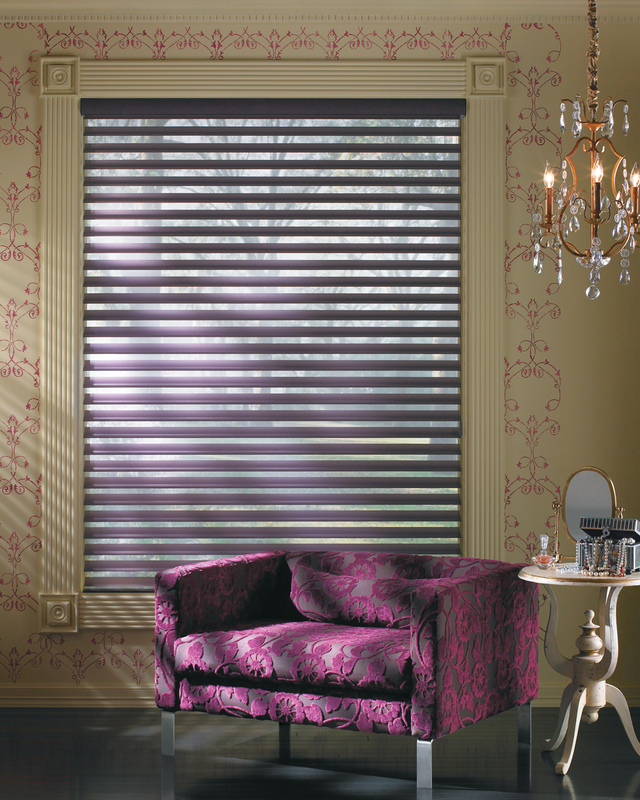 8 richly-textured colors with colored sheers. 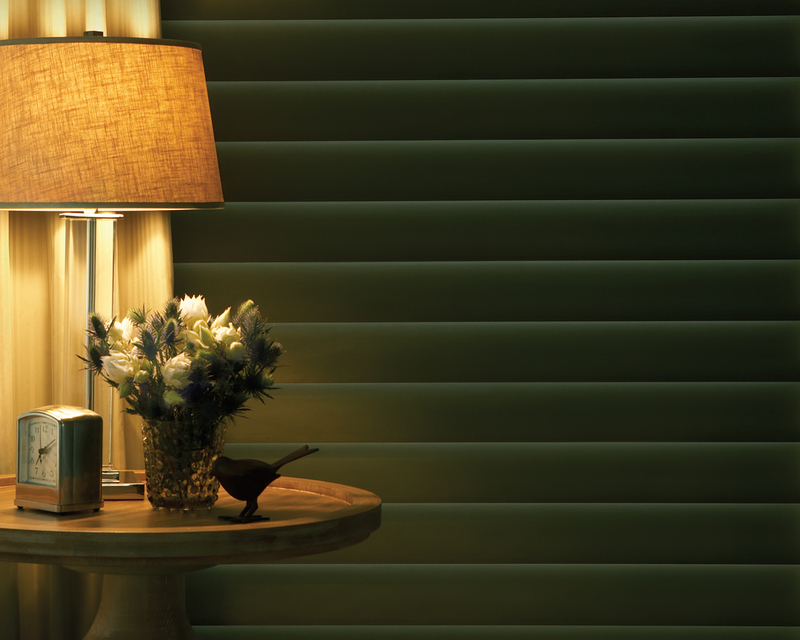 8 neutral colors with nature-inspired vanes. 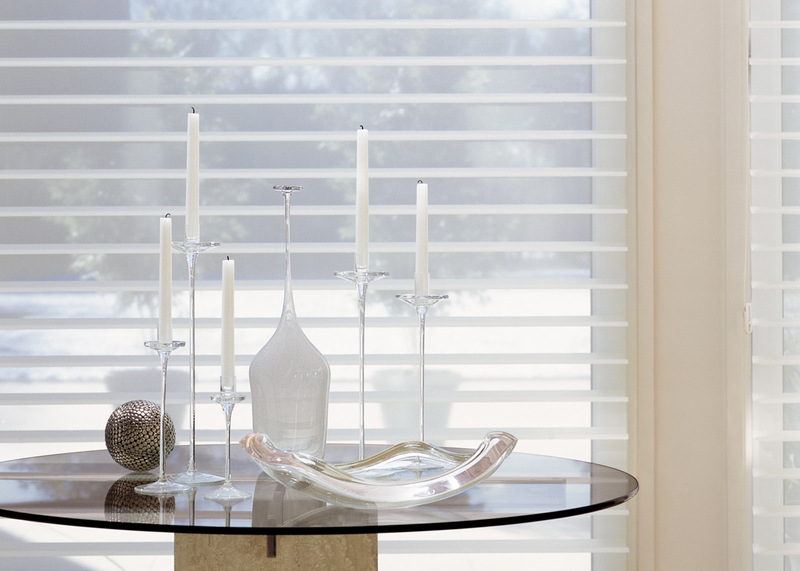 4 subtle colors with an iridescent pinstripe sheer. 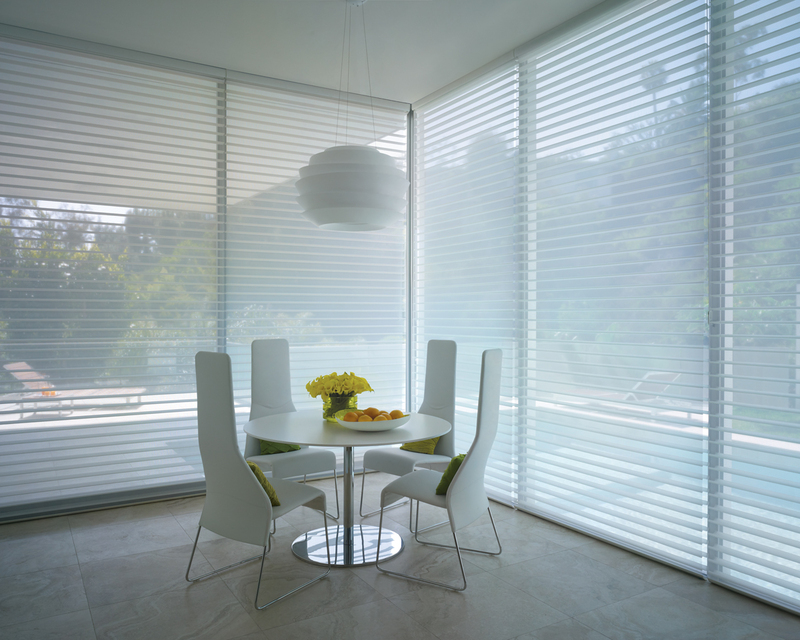 4 strong sunscreen colors with colored sheers. 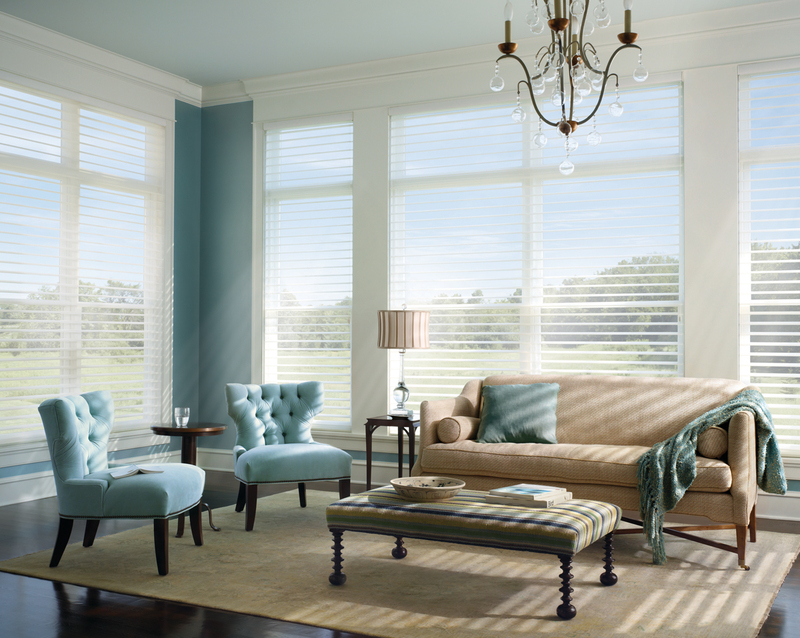 8 popular colors with classic-woven vanes. 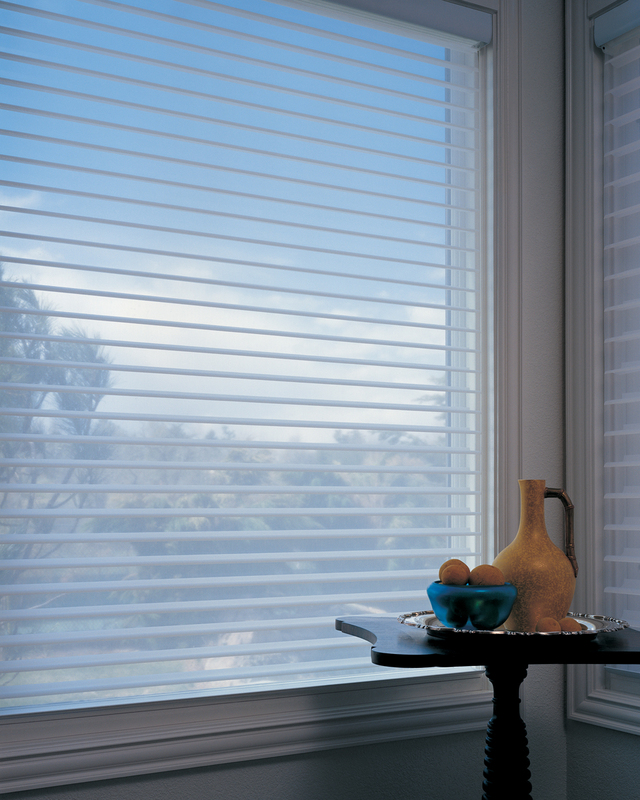 Continuous cord loop makes it easy to lift large shadings. 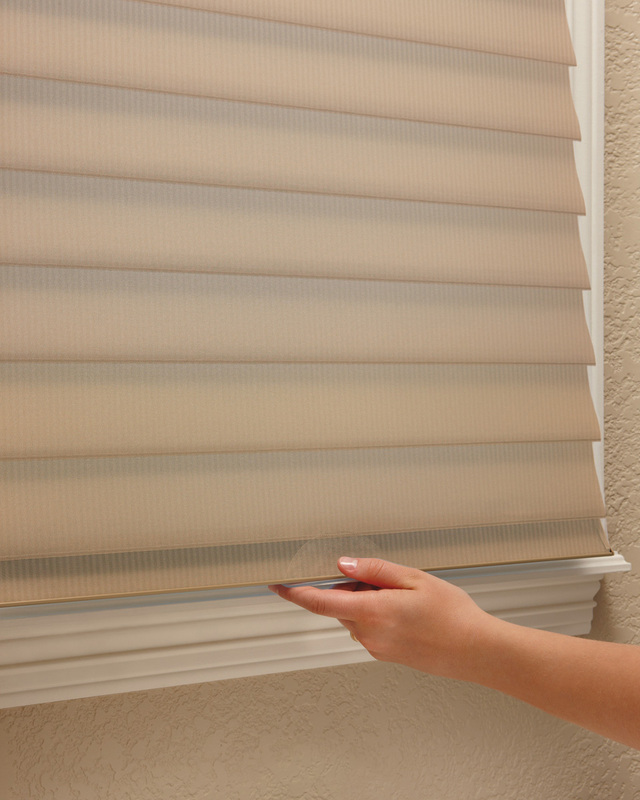 Raise, lower and tilt shadings with one retractable cord. 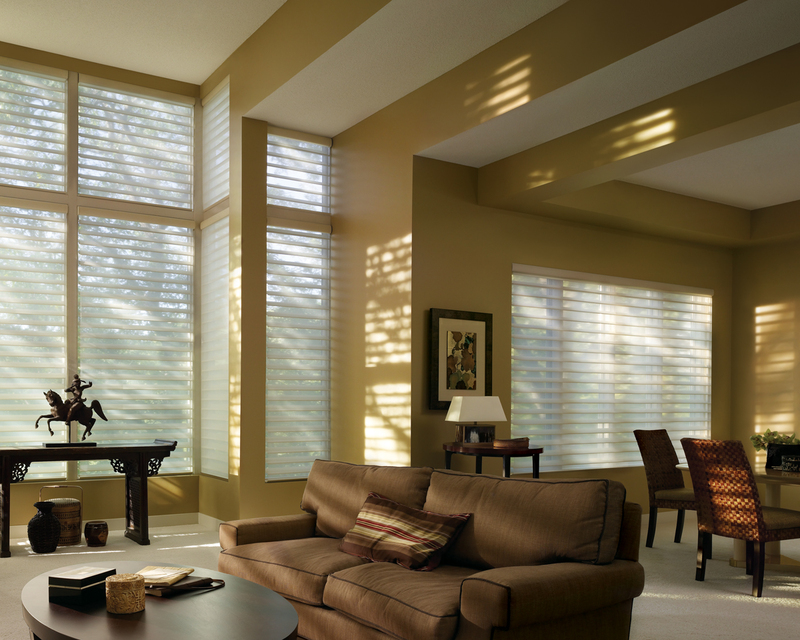 Raise, lower and tilt shadings with no cords. 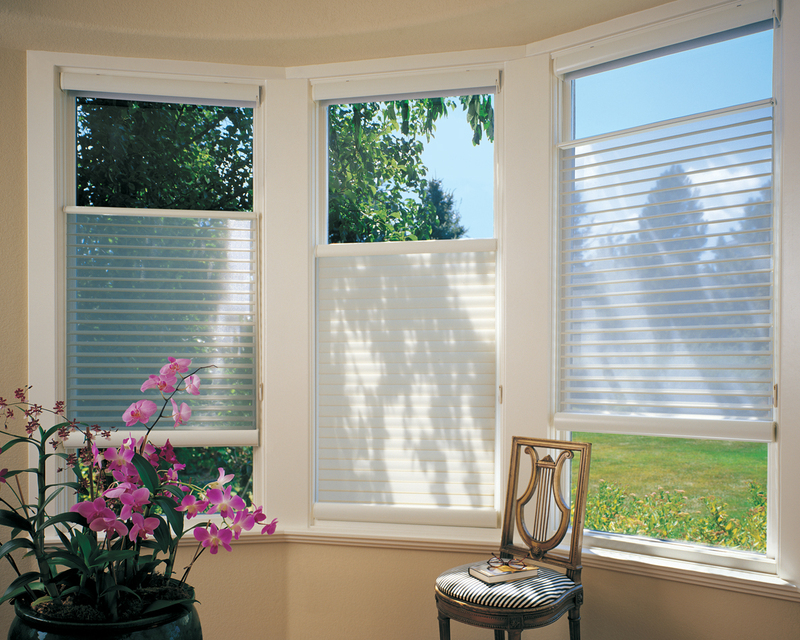 For narrow windows. 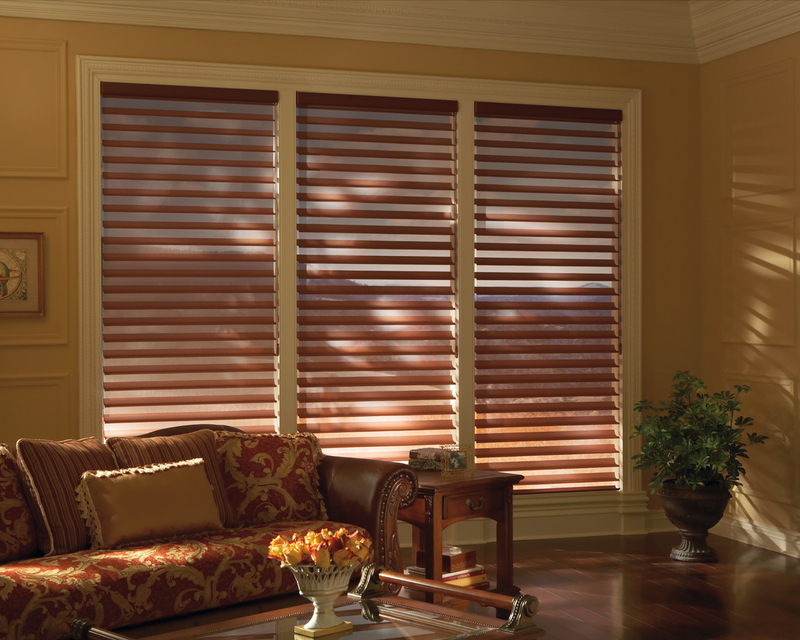 Shadings cannot be raised or lowered, but vanes may be positioned from fully open to closed. 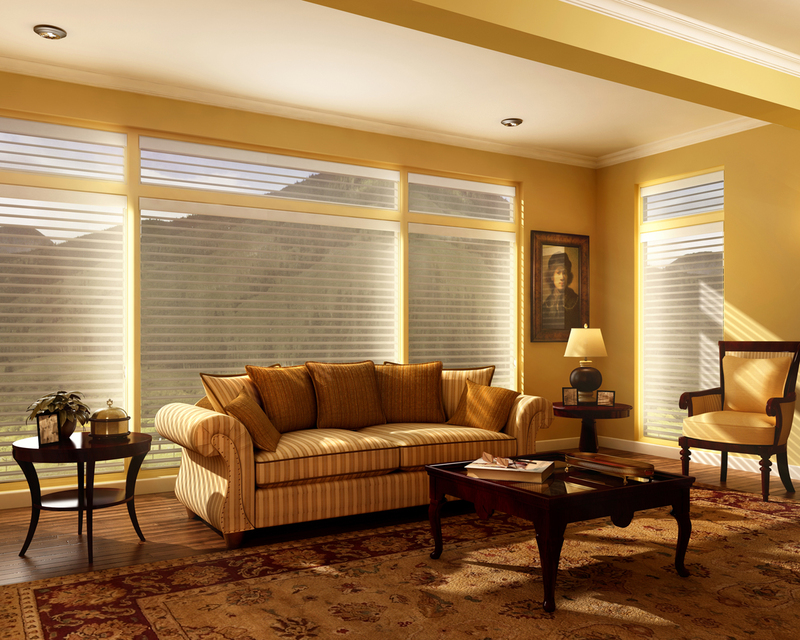 Shadings operate top-down, bottom-up or in combination. 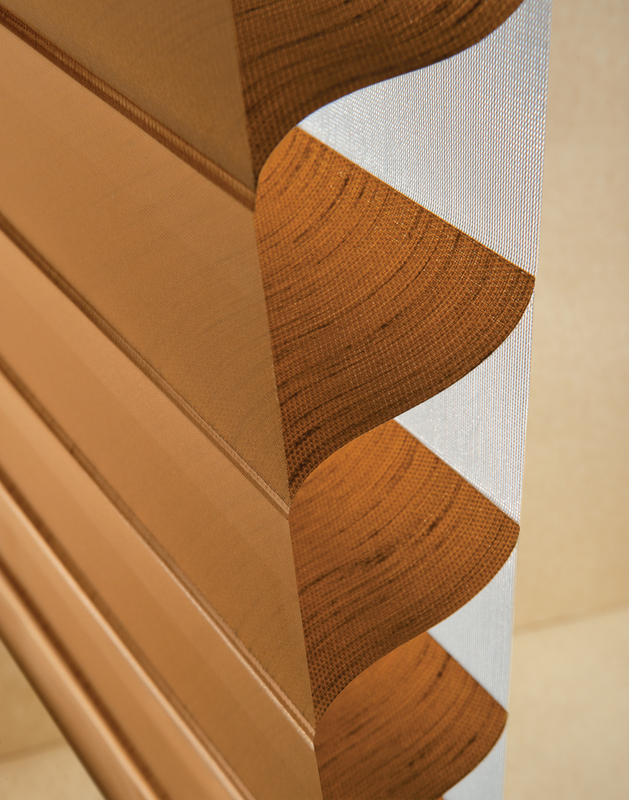 The TiltAnywhere feature allows the vanes to function in any position. 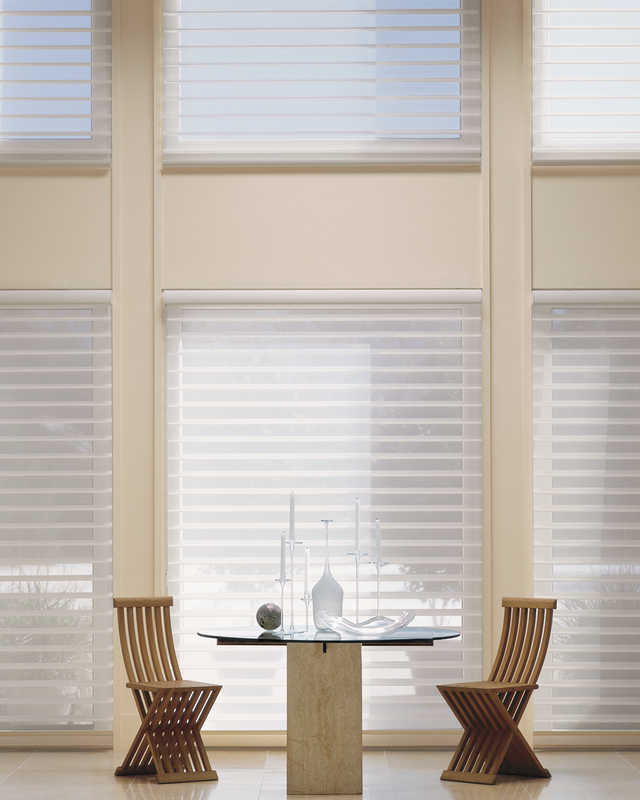 Two shadings share the same headrail; each shading operates independently. 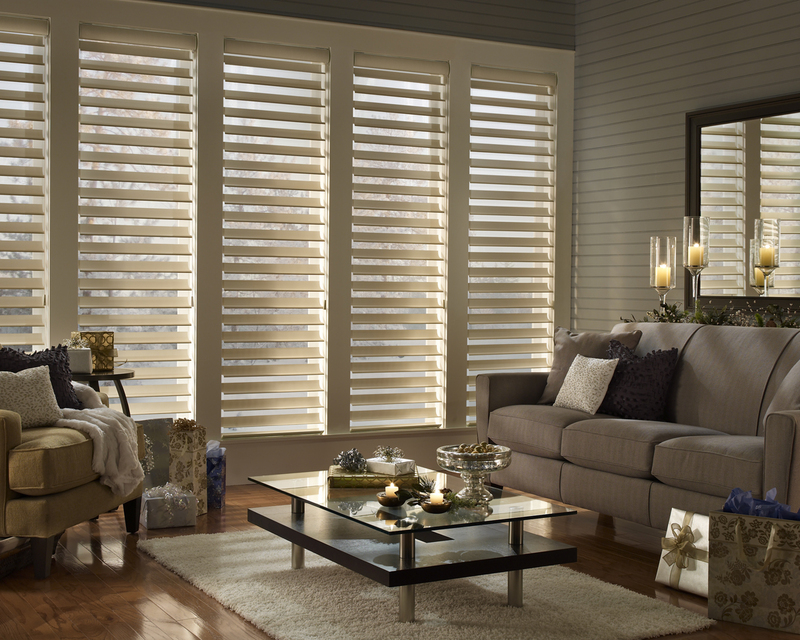 Vanes remain in a fully opened position and are non-operable. 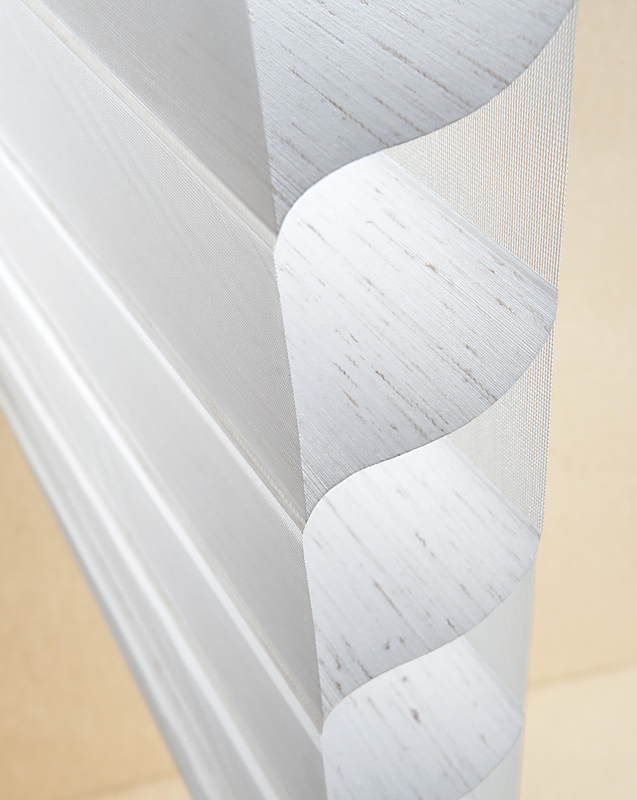 Vanes remain tilted upward in the closed position and are non-operable. 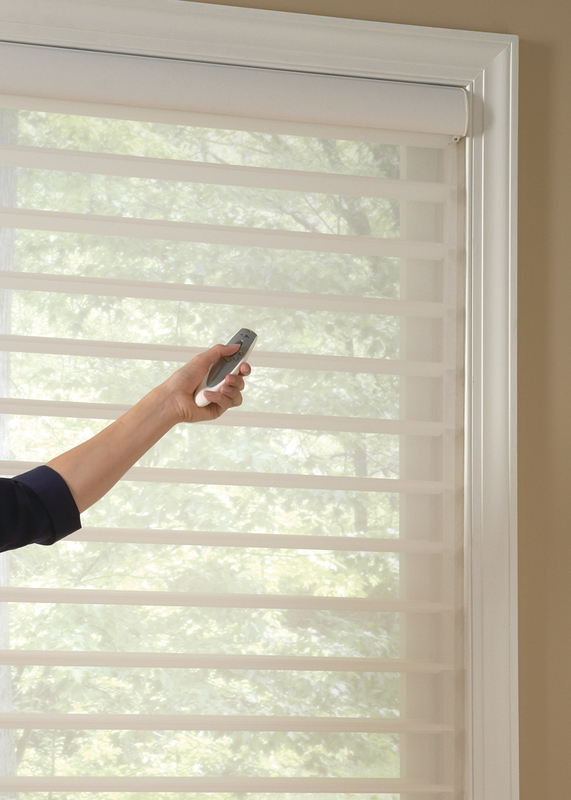 Our state-of-the-art PowerRise 2.1 battery-powered system offers convenience with the touch of a button.